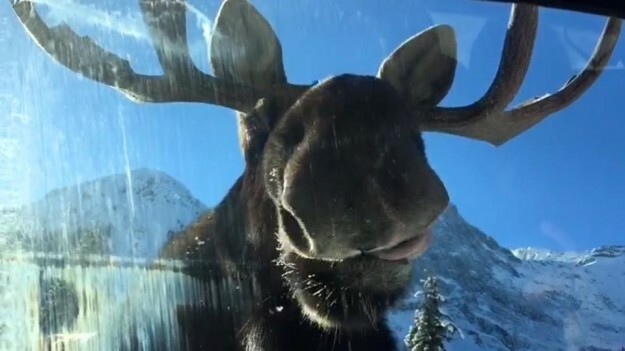 After parks officials in Alberta, Canada issued a warning last week about moose licking the salt off cars in parking lots near Banff National Park it seemed far-fetched. And then sure enough a video surfaced of a moose licking salt off a car as if it was a lollipop. The passengers, Theresa Malan and her husband CJ, told Buzzfeed News they remained in their car for 30 minutes as the moose licked it clean of road salt residue. While they could have honked the horn and scared it away, Theresa said they were enjoying the experience. She said they had heard reports of moose licking cars and saw this one in particular lick another parked car. So they got their smartphones ready to shoot video. They said the moose just came right over and started doing its thing, licking at the car as if it was an ice cream cone. Moose and other animals such as deer and elk seek out salt deposits as a way to supplement their diets and provide valuable nutrients and minerals that might be missing from their food source. Lactating females and young bucks for antler growth especially require salt.